Journeys to/from Cercanías stations in Madrid require travellers to transfer by Cercanías train (suburban rail network) before boarding their booked Media Distancia or Regional train to destinations elsewhere in Spain. Loco2 does not currently display a warning in search results, since it's not included in the information supplied to us by the rail operator when we search for trains. However, it is indicated on your print-at-home ticket. Travellers boarding at these stations begin their journey on the local Cercanías network to Aranjuez, where they transfer onto their onward train. You are not bound to a specific Cercanías train. 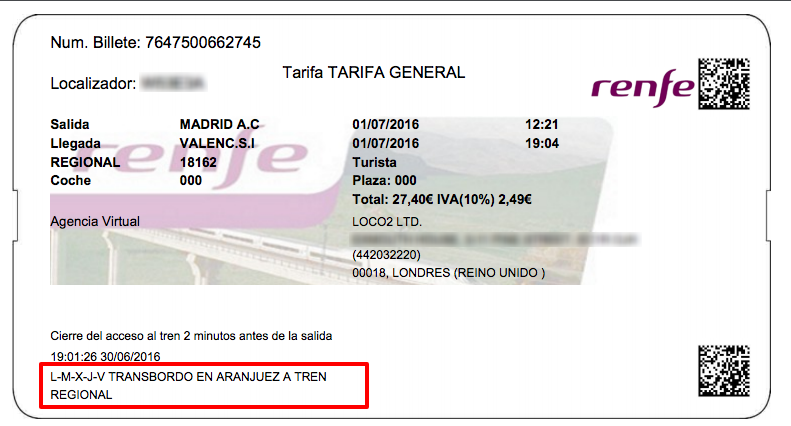 However, the departure time on your ticket refers to a specific service and incorporates enough time to make the transfer in Aranjuez. If you wish to travel on a direct train, you should select a high-speed AVE or Intercity train, instead of a regional or Media Distancia (MD) ore regional service. Also, selecting Madrid (any station), rather than a Cercanías station will omit most of these services.